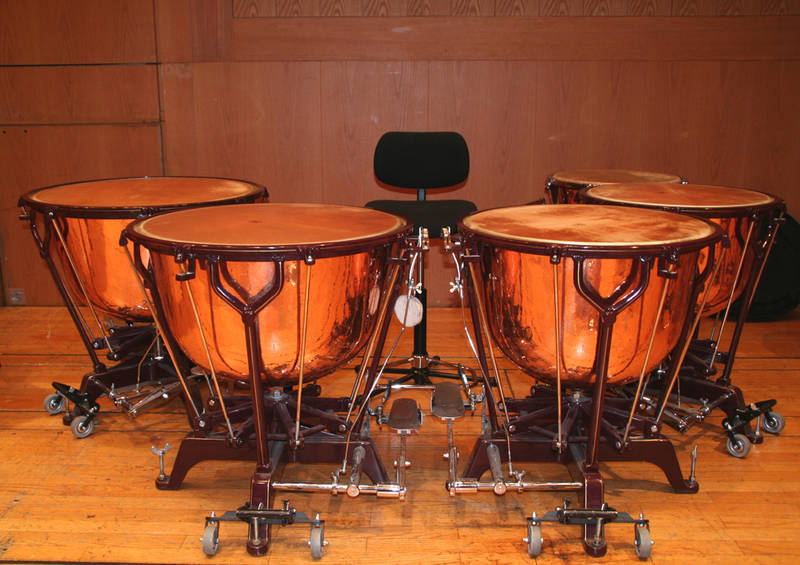 Here I would like to present “our” timpani and give some information about them. 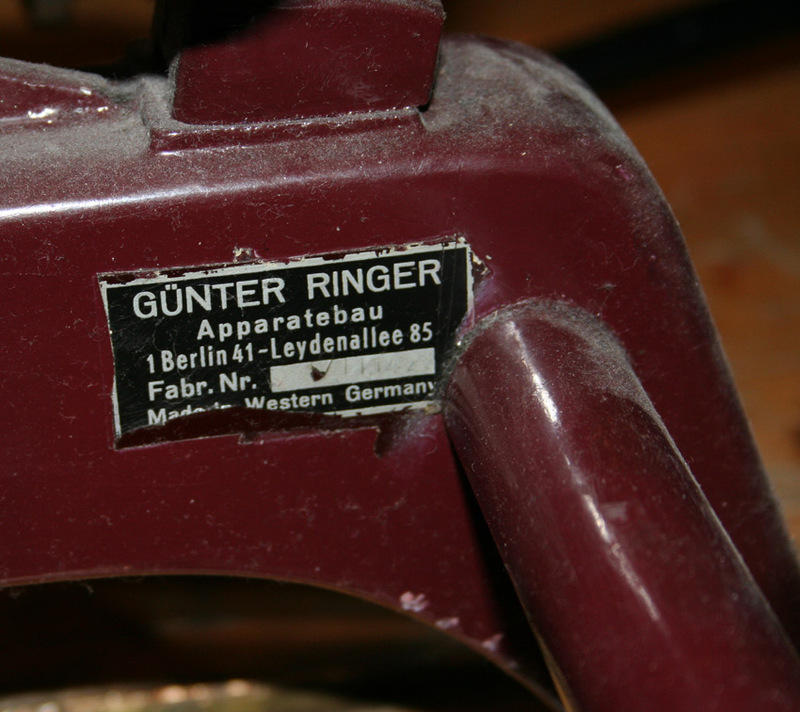 This original Günter-Ringer-set, which consists of 5 timpani altogether, is my favourite. Maybe because I “was allowed” to practise on identical sets when I was studying at the UDK Berlin and at the Orchestra Academy of the Berliner Philharmoniker. Their identical construction to 2 of the 3 sets at the Berliner Philharmoniker means these timpani must have been built around the end of the 60s, beginning of the 70s. 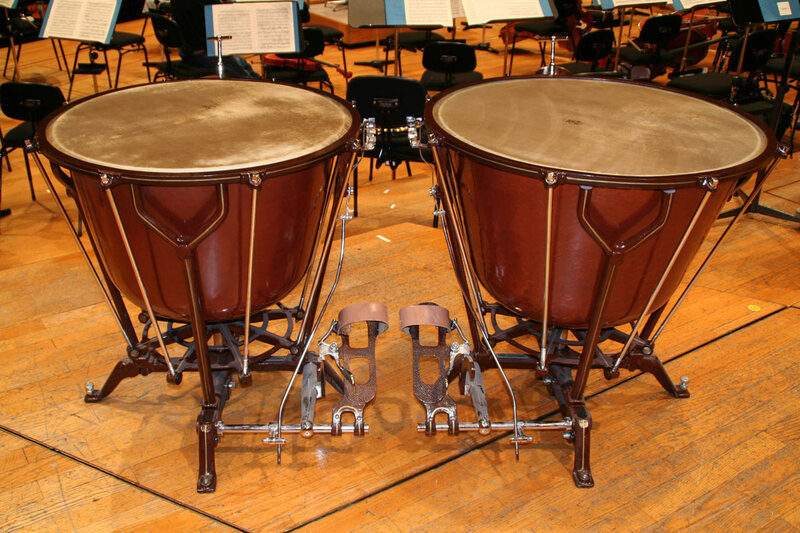 The sound of these timpani can best be described using the terms “romantic orchestra timpani”, or “Berlin timpani”. On the one hand, the sound harmonizes with the typical German darker orchestral sound; on the other, the tonal possibilities are nearly unlimited, especially when using calf skin. These timpani exhibit a perfect balance between “rumbling” and “singing”. For those interested: their sizes are 78 cm, 72 cm, 66 cm, 60 cm and 52 cm. 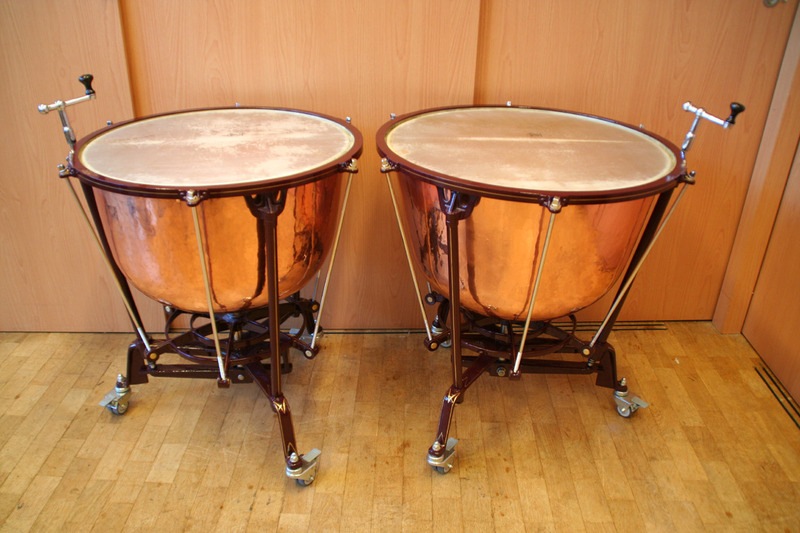 This pair of Dresden timpani originally belonged to the theatre in Regensburg and have been in the possession of the Münchner Philharmoniker since 2000. Having been restored with special care, they look simply great and have this unique “Dresden sound”, derived from the very thin kettle and the particularly simple construction, along with an extremely heavy diecast base. Owing to their thin kettle, these instruments sound very warm and respond very easily, although their fortissimo is limited. 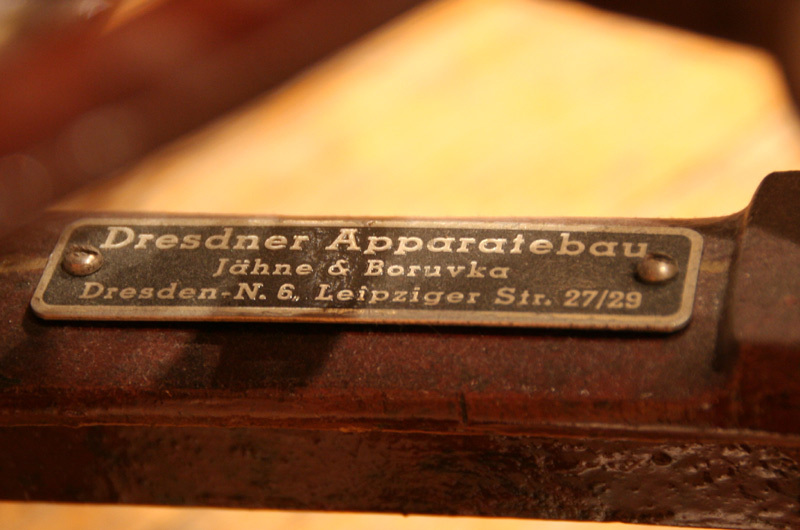 … and then, according to Dresden tradition, best using flannel sticks!! 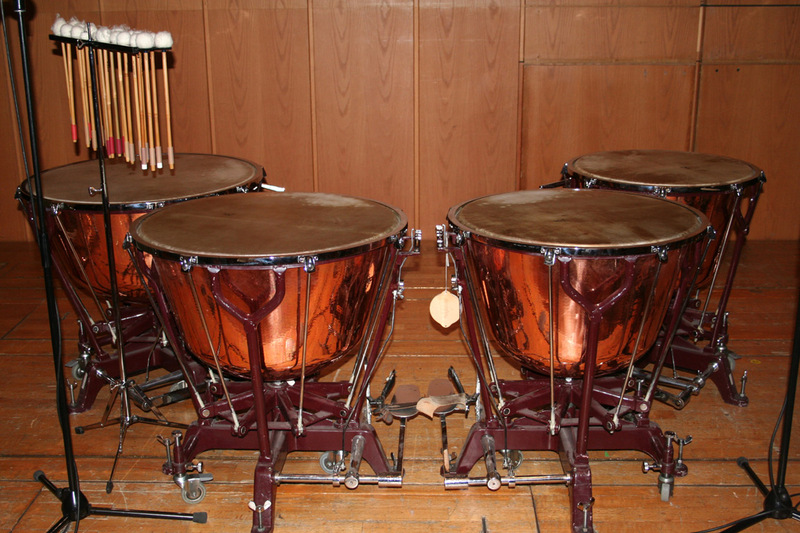 According to Wolfgang Hardtke, these timpani were built in the 20s of the 20th century (diameter: 73 and 65 cm). This „Kurbelpauke“ pair is my own. They were extensively restored by Wolfgang Hardtke, as they were in a neglected condition when I bought them. Now they look simply wonderful… Ideal for Haydn, Mozart, Händel, but also for the early Beethoven symphonies with small orchestra and “historical and/or contemporary performance”. The sound is very open and free, naturally with less volume, but still very sonorous on c-G, even or especially with leather or wooden sticks.